Sweet potato fries are all the rage right now and it’s easy to understand why. Slightly sweet, slightly spicy and with a good dose of crunch – we’re certainly come a long way since the days of sweet potato casseroles covered in marshmallows. But that being said, there always seems to be surcharge of some kind that comes with this fancier version of the French fry. It’s either an extra dollar or two on a menu or in the grocery store, and for what? How hard is it to cut sweet potatoes into wedges, season them with some awesome herbs and throw them in the oven for a healthy, homemade sweet potato wedge alternative? Not that hard, I thought. With a little sleuthing online (thanks Allrecipes!) and some mixing and matching of previous recipes, I came up with this homemade version of spicy sweet potato wedges that satisfies all the requirements of the restaurant versions with none of the added ingredients or deep-frying. And they’re gluten-free and paleo to boot. In no time at all, you can have big batch of homemade sweet potato wedges to serve alongside chicken, burgers or whatever else you choose. Enjoy! Peel and slice the sweet potatoes into wedges (like large fat french fries). Place the wedges into a large bowl and add the olive oil, brown sugar, paprika, pepper, onion powder, garlic powder, chili powder, red pepper and cayenne pepper. Toss until the potato wedges are evenly coated with the seasonings. 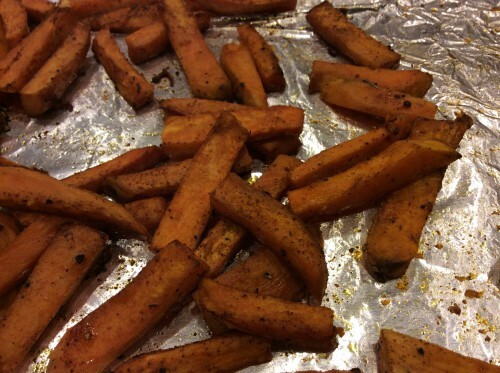 Spread the wedges on a baking sheet lined with tinfoil (this makes clean up a breeze). Bake for 15 minutes, turn the spicy sweet potatoes over and bake for another 10 to 15 minutes. Serve alongside burgers, chicken or whatever else with a side of barbecue sauce for dipping if you like. Don’t these look good – and they’re homemade to boot!